There are numerous Jules Verne anthologies out there. Most of these anthologies are being put out by publishers that are reprinting bad English language translations, mostly because the material is in the public domain, meaning it doesn’t cost them anything. There are few anthologies out there that are worth checking out and some to avoid. Translator & Critical Material: Frederick Paul Walter. Albany, NY: SUNY Press, 2010. 668 pages. some illus. RECOMMENDED (read why below) Get it at Amazon.com or Barnes & Noble. Arthur C. Clarke once remarked that Jules Verne was “one of the greatest storytellers of all time” but added that he was also “one of the most widely distorted, censored, and mistranslated authors of all time” (William Butcher, Jules Verne: The Definitive Biography [New York: Thunder’s Mouth, 2006], xv–xvii). From the pioneering work of the late Walter James Miller in the 1960–70s to my own modest contributions more recently, Verne scholars have made good progress in rehabilitating Verne’s literary reputation over the past few decades. There has been an exponential increase in the number of academic studies of Verne’s oeuvre, many of which have appeared in the pages of SFS. And, since 1965, more than three dozen first–time or improved English translations of his novels have been published (as per the bibliography available in Verniana, an online journal devoted to the legendary author, at <http://www.verniana.org/volumes/01/HTML/ArtBiblio.html>). Frederick Paul Walter’s omnibus collection of new Verne translations called Amazing Journeys is the latest and one of the best examples of this anglophone Vernian “renaissance.” It offers (at a surprisingly affordable price) very good English–language versions of no fewer than five of Verne’s most popular works: Journey to the Center of the Earth (1864), From the Earth to the Moon (1865), Circling the Moon (1870), 20,000 Leagues under the Seas (1869), and Around the World in 80 Days (1873). In his brief but perceptive introduction—titled “Science and Showbiz” and to which I will return in a moment—Walter outlines his two–fold goals: he wants his “reader–friendly” translations of Verne to be “accurate … complete down to the smallest substantive detail” but also to be “communicative … to convey [Verne’s] humor, theatricality, and scientific excitement” (10). The second of his goals—“communicativeness”—proves to be somewhat more complicated. To convey, in translation, the intricacies and effects of an author’s narrative style is a real challenge for any translator. In my opinion, Walter’s bold new translations of Verne achieve this goal better than most. But some purists might argue that he too often crosses the line between faithfulness and creativity. For example, the very title of the omnibus is Amazing Journeys—referring, one assumes, to Verne’s own collection title Voyages Extraordinaires. But “amazing” (suggesting the reader/observer’s reaction to something) is not really the same thing as “extraordinary” (an attribute of the thing itself). And, although nicely descriptive, Circling the Moon does not precisely reproduce Verne’s original title Autour de la lune [Around the Moon]. Further, consider some of the following passages in the novels themselves. In chapter 8 of Journey to the Center of the Earth, Professor Lidenbrock forces his nephew Axel to ascend a tall church steeple in Copenhagen in order to cure him of his fear of heights and to prepare him for their underground explorations. He tells him: “Il faut prendre des leçons d’abîme!” [We must take abyss lessons! (trans. Malleson) or You need to take lessons in precipices! (trans. Butcher)], which is rendered here as “You need to get an education in depth!” (38; emphasis in original). The clever phrase “education in depth” does not transcribe exactly what Verne wrote; it does, however, denote the same idea and—important for Walter—communicate the same tongue–in–cheek humor and wordplay that the author often indulges in throughout this novel. Chapter 22 of part I of 20,000 Leagues under the Seas (notice how Walter includes the final “s” on Seas, an often overlooked detail but an accurate transcription of Verne’s original title) features an episode in which Papuan savages attack the Nautilus and are repulsed by an electrified companionway. Verne’s original text says: “Mais le premier de ces indigènes qui mit la main sur la rampe de l’escalier, rejeté en arrière par je ne sais quelle force invisible, s’enfuit, poussant des cris affreux et faisant des gambades exorbitantes” [But the first of these natives to put his hand on the railing of the companionway was thrown back by some invisible force, and ran off shouting and jumping about wildly (trans. Bonner)]. Walter’s translation says: “But when the first islander laid hands on the companionway railing, he was flung backward by some invisible force, Lord knows what! He ran off, shrieking in terror and wildly prancing around” (413). Colorful expressions such as “flung back,” “Lord knows what!,” “shrieking in terror,” and “wildly prancing about” certainly serve to enliven the scene for the anglophone reader—but one might also argue that they push the envelope of what is an acceptable level of translator embroidery. Finally, at the end of chapter 2 in Around the World in 80 Days, Passepartout has just made the acquaintance of his new employer Phileas Fogg. Unaware that they will soon depart on an adventure–filled race around the globe, he is congratulating himself on being hired by such a staid and predictable gentleman: “‘Cela me va! voilà mon affaire! Nous nous entendons parfaitement. Mr. Fogg et moi! Un homme casanier et régulier! Une véritable mécanique! Eh bien, je ne suis pas fâché de servir un mécanique!’” [This is just what I wanted! Ah, we shall get on together, Mr. Fogg and I! What a domestic and regular gentleman! A real machine; well, I don’t mind serving a machine (trans. Towles) or This suits me! This is the perfect place for me! Mr. Fogg and I will understand each other perfectly. A homebody, and so methodical! A genuine automaton! Well, I am not sorry to serve an automaton! (trans. White)]. Walter’s rendering of this passage is as follows: “It’s a perfect fit! It’s right down my alley! We’ll get along famously, Mr. Fogg and I! He’s a homebody, an orderly man! A real piece of machinery! Well, it won’t pain me to have a domestic appliance for a master!” (547). The use of the American colloquialism “right down my alley” by a Victorian–period character of French background may seem to some readers a bit anachronistic or culturally suspect. And, although I personally find it hilarious, some might also view Phileas Fogg’s transformation from a “machine” to a “domestic appliance” to be a clear case of excessive translator license. Such attempts by Walter to spice up Verne’s prose do not necessarily constitute a betrayal of what Verne originally wrote. Literal translations are often worse than less literal ones: they are too “accurate” and not sufficiently “communicative.” Consider, for instance, the following examples from chapter 21 of From the Earth to the Moon. In this episode, the plot focuses on a duel to the death agreed to by the main protagonists Barbicane and Nicholl, forcing Michel Ardan to intervene in order to prevent this tragedy from happening. The chapter is titled “Comment un Français arrange une affaire” [How a Frenchman Settles a Matter]. The standard English translation for this chapter is “How a Frenchman Manages an Affair,” a literal rendering whose stylistic clunkiness is exceeded only by its confusing ambiguity. Walter’s version—both clearer and snappier—is “How a Frenchman Deals with a Duel.” At one point in this same chapter, Barbicane’s Gun Club colleague J.T. Maston, worried about his friend and fearing the worst, laments: “‘Il faut que tout soit fini,’ dit Maston découragé. ‘Un homme comme Barbicane n’a pas rusé avec son ennemi, ni tendu de piège, ni pratiqué de manoeuvre! Il est trop franc, trop courageux.’” The traditional and literal translation of this passage is “‘It must be all over,’ said Maston, discouraged. ‘A man like Barbicane would not dodge with his enemy, or ensnare him, would not even manoeuvre! He is too open, too brave’” (trans. Lewis). Compare this stilted rendering with Walter’s more supple and expressive version: “‘It must be over and done with,’ Maston said despondently. ‘A man like Barbicane wouldn’t trick his enemy, or lay a trap for him, or even use any strategies! He’s too direct, too courageous’” (199). It seems obvious which of the two versions “communicates” better. These five classics are more than household words, they’re joyous parts of our American heritage, from their films and Saturday morning cartoons to their connections with the U.S.S. Nautilus, the NASA space missions, and our other technological triumphs. And the USA itself is crucial to these novels: two have major American sequences, one divides its time between America and outer space, and still another takes place entirely in the U.S. So this volume is targeted to the American public…. For American purchasers, then, the texts convert metric figures to feet, miles, pounds, and other U.S. equivalents. The Americana, too, will be convincing for U.S. readers, sparing you the eye–rolling moments that can occur with overseas translators…. Walter may be exaggerating his case somewhat here, since neither America nor Americans figure anywhere in Journey to the Center of the Earth, they are foregrounded in only a relatively small part of Around the World in 80 Days, and—apart from the frigate Abraham Lincoln and Ned Land—there is little of either evident in 20,000 Leagues Under the Seas. But it is certainly true that Verne, at least during the first half of his writing career, greatly admired all things American (see the special issue of Revue Jules Verne 15  called “Jules Verne et les États–Unis” as well as my own article “Jules Verne’s America” in Extrapolation 48 [Spring 2007]: 35–43). As for Verne’s supposedly “American mindset” and his being one of literature’s “leading humorists,” I have my doubts, but I will leave that discussion to other Verne scholars. One discovers a bit more (typically American?) puffery and hyperbole in one of the otherwise excellent introductions that precede each of the five novels. 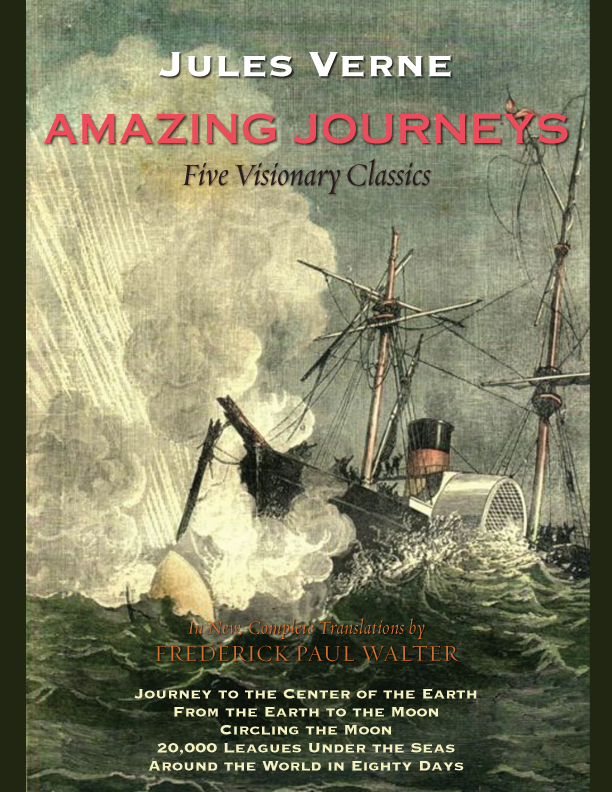 Walter claims that Verne’s Journey to the Center of the Earth is “the world’s first time–travel novel,” ignoring a host of pre–1864 time–travel stories including Louis–Sébastien Mercier’s Memoirs of the Year Two Thousand Five Hundred (1771), Émile Souvestre’s The World as It Shall Be (1846), and even Charles Dickens’s A Christmas Carol (1843). He also claims that Verne’s novel was the first to feature “monsters from the Age of Dinosaurs,” but this honor actually goes to Verne’s fellow Frenchman Pierre Boitard in his Paris Before Man (1861). These few quibbles aside, Amazing Journeys: Five Visionary Classics remains a unique and impressive red, white, and blue–collar collection of refreshing translations of Verne that gives new life to some of the old storyteller’s most famous tales. It is recommended for all English–language aficionados of Jules Verne, American or not. -- Arthur B. Evans, “Rejuvenating the Old Storyteller,” Science Fiction Studies, 37.3 #112 (Nov 2010): 515-519.